A wedding is the time of celebration and expenses. 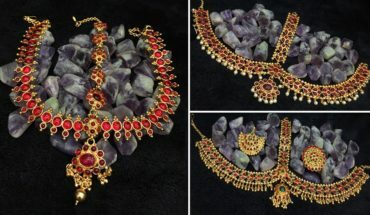 After all the money spent on décor, food, venue, invitation, and dresses, it’s the time for jewellery to take the splurge. Every bride wishes to sport a designer wear with a matching heavy jewellery. After all, it’s her big day, and the deal cannot be ignored but can be negotiated. Well gone is the time when brides emphasize to buy a brand new bulky wedding jewellery. Renting is a new trend among the modern brides! With a lot of saving, renting has many more advantages over buying new. With multiple varieties available to match your costume to saving a big hell of money are the few gains of renting one, rather buying many. After all the décor, chairs, the venue is for rent, why not the wedding jewellery. It not only gives you ease of your bank balance but also caters you needs and desire. Being practical and realistic are the new symptoms of a bride. When you are not going wear the heavy piece in your daily wear, what is the point of spending heavy amount? Renting the jewellery piece gives you the option to get some other wedding services. Both wedding dress and jewellery can take your budget more than to 60, 000 rupees. There should be a limit, get a designer lehenga and rent the desired jewellery. It’s almost the equal fraction of the allocated budget. It’s like you having the cake and eating it too. The sparkle flashy wedding jewellery needs to care like a baby. It’s so huge that if you wore it to a party or family get together, you are sure to look like Christmas tree. And that’s absolutely stupid! The care it demands of regular polish and cleaning will take your entire saving budget. Set yourself free, and rent a fresh piece matching your lehenga. Stay tension free after the wedding ceremony. Relax and doesn’t stress your mind about “where is the jewellery kept” of course rented too need to care, but until it’s not made of precious stones, it doesn’t attract the people. So be hassling free and rent your jewellery for the wedding day. When the days look short and all your pending works seem to be incomplete, some extra time is the bliss. After pending a whole day with the people, wedding managers and shopping for your dresses, purchasing a brand new from the market is the stabbing thing. With a selection of matching your attire, all the time looks killing. While renting the whole, can save a lot of time, which surely you can invest in other important things. There are the few benefits of renting afresh pair of wedding jewellery rather than buying a mega price one. One may get the jewellery on rent for the big fat Wedding day the reasons being very simple as already mentioned. Some tips for choosing the wedding jewellery are as mentioned in the upcoming points in the article. If you follow these simple things, you are bound to look like a princess on your special day and rock it. Before you even think of purchasing marriage jewellery it is important to know what you’re going to be dressed and what jewellery on the marriage day. Therefore, before choosing jewellery ensure to validate the wedding dress as the jewellery needs to focus around it, therefore, looks good. The jewellery must not get noticed on its own. Instead, it needs for making you take a position out! The next step would be for making a record of jewellery shops in your area that you would not mind renting the jewellery from. If not in your area you must not think twice to go somewhere else in order to get the job finished. Also, nowadays there are many websites that only deal with marriage jewellery and you may even get them on renting basis. Therefore, take a look at various marriage websites too if you’re looking at some stylish and delightful jewellery. Now that you’ve found your store, you would need to check out the various designs on offer. See to it that the jewellery you take on rent must make you look wonderful and as previously described it must allow you to take a special stand. Another essential aspect that you need to consider when you think of purchasing marriage jewellery is that of their overall convenience. Only buy jewellery if you’re going to be completely relaxed with it. When we say relaxed, we’re discussing both luxury as well as convenience in using it. Hence, following the above tips, you can either buy the jewels either for your wedding or on special occasions. Use this article as a reference when you plan to buy anything and simply glitter on the special day.